Barefooting, barefoot running, barefoot hiking, Pose running, ChiRunning, minimalist shoes, and Vibram 5 Fingers are all the buzz these days. They all share the notion of transitioning one’s gait from heel striking to midfoot or forefoot striking. They are concepts, technics, and tools that emphasize or result in a shorter stride and a lighter landing more forward on the foot for a less jarring journey for your body. For some of us, the consequences of very gradually making this gait shift is nothing short of miraculous: the incidence of injury and pain plummets; the sense of ease and fun when in motion skyrockets. The pounding forces generated by contacting the earth are captured by the foot when one forefoot strikes and redirected as forward momentum as opposed to those forces being absorbed by the knee and hip when heel striking. This seemingly small change in gait has a huge impact on the body because of the high number of rep’s involved with walking or running day after day, year after year. The biggest challenge in becoming a forefooter is that the time required to successfully transition your body is similar to learning a new language: think many months to a couple of years. In contrast, as far as the mind is concerned, it’s simply a matter of heading out like you’ve always done but in different shoes or wearing none at all. And of course the maddening part is that no one wants to invest months or years to determine that the strategy isn’t right for them--especially for something that looks so simple. We never looked back after our 1st day hiking barefoot. Many skeptics of the form are convinced it’s just a fad, which is surely true for some participants. But for those of us who have felt knee pain vanish on steep hiking descents and when running, forefooting in thin shoes or no shoes is here to stay. The easiest way to sample forefooting is to trot down a gentle slope with a well-groomed, grassy surface in your bare feet. Breaking just out of a walking stride into a slow jog improves the odds that you will forefoot naturally. Lifting your knees and taking shorter steps while aiming to land on your forefoot instead of the heel and you likely will be capturing the essence of the form in a few minutes. Even if you have no interest in barefoot sports, doing a couple of brief practice sessions of 1-2 minutes with bare feet allows you to experiment with the approach without investing in shoes. And barefooting is the easiest way to discover the correct form and to evaluate how forefooting feels in your own tissues. For people pondering making the gait shift, the decision to buy shoes often suddenly becomes an urgent matter. If that’s where you are, the next section will give you our experience with 4 different brands of minimalist shoes and several products within 2 brands. If shoe selection isn’t on your list today, you may want to skip the Shoe Review and look at some options for gradually preparing your feet and body for the bio-mechanical changes which will occur should you proceed with forefooting. And nothing is lost with doing these exercises even if you remain a committed heel-striker. In a few short years there has been a welcome explosion in the availability of minimalist shoes--an explosion that been user driven. Devotees of the barefooting concept were hungry for a near-shoe to help them out in gravel, snow, and on occasional bits of broken glass--things that the elite barefooter’s navigate well--but not the novices. In 2009, I was one of those hungry novices who was reading online about compromises, like glueing rubber treads onto moccasins to meet my near-barefooting mud and gravel needs. Light-footed runners before me had been cobbling-together all sorts of similar solutions for years. Vibram introduced their 5 Fingers model in 2005, not for runners but for water sport enthusiasts, but runners nabbed them and shared their online reviews amongst themselves. 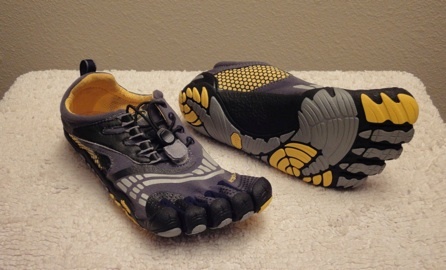 Only in mid-2010 did Vibram introduce the Bikila--their first model actually designed for runners. Feelmax of Finland came up with a to-die-for minimalist running shoe that everyone loved and then mysteriously stopped production. A manufacturer of made-to-order moccasins (softstarshoes.com) tucked away in Corvallis, Oregon finally yielded to runners who were grinding their leather moccasins to bits and glued on a thin, slab-like Vibram sole. In the last year, they offered a new running shoe and have added a new designer to their team to better serve the runners. Demand led supply for years until in 2011 minimalist’s finally had a choice of footwear, especially since the mainstream running and outdoor shoe manufacturers started putting forth their own interpretations of what minimalists should want. We’ve only sampled a half dozen of the available products, but here’s what we’ve decided along the way. We highly recommend going straight to the new Komodo Sport LS for your first pair of Vibram 5 Fingers. Both the Bikila and Komodo are lined models and the lining wonderfully circumvents the considerable skin loss I have suffered in the various unlined KSO models. The soles on both models are sufficiently aggressive to deliver good traction and thick enough to ease the transition to minimalist shoes. 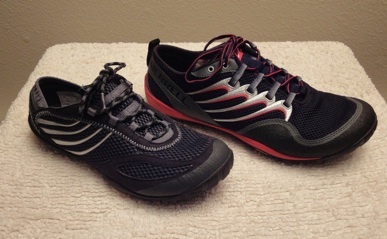 The Komodo is a great choice for beginning forefoot strikers or those who are at home with the form (pictured below). The Bikila’s appear to have a more aggressive sole than the Komodos but we didn’t observe any performance differences when wearing the 2 styles on the same hiking trails, either walking or running. If you prefer the Bikila’s, carefully inspect the big toe pocket fabric at the level of the insole to confirm that the insole doesn’t slightly protrude--perhaps Vibram will correct this problem in future production runs. The variability in construction from one toe pocket to the next is a significant issue for some of us with Vibrams. Try on a couple pairs and carefully note seam edges and rub spots. I’ve especially had difficulty with the seams rubbing on the side of the bunion bone--the joint at the base of the big toe--the skin there is thin and slow to heal. Also as you walk round in them, note if the seams on the top between the toes feels too bunchy: if something like this draws your attention when trying them on, it may become a major issue after several hours of wearing. The white spots highlight the holes in my KSO’s. Personally, I recommend fitting 5 Fingers a little lose rather than tight as Vibram recommends. I bought my first 3 pairs 2 sizes larger than recommended and still had a number of problems, including significantly injury to a toe joint because the toe couldn’t quite seat properly in the pocket. Don’t count on them stretching out to solve such problems. I finally went 3 sizes larger and have some air space at the end of several toes but my feet are much happier overall. And note that the sizing varies between models. That said, Bill’s KSO Trek’s in leather did stretch, and stretch a lot, but none of the others stretch enough to solve fit problems. He now must wear toe pocket socks and cinch the straps down tight to keep them on but he loves the extra padding and traction of the model. The original KSO models are superior to the heavier soled KSO Treks and KSO SportTrek models for road feel and therefore for conditioning your feet if you are transitioning to barefooting. When I had a pair each of KSO’s and KSO TrekSports, I wore the thinner KSO’s for hikes under 4 hours and the TrekSport’s for over 4-hour hikes which was a good compromise between conditioning and endurance. But the basic KSO’s ‘razor-siped’ sole is terrible in mud--it has no traction at all. We’ve both gone down hard when forced to descend on a steep, muddy trail when wearing the KSO’s. We both still wear KSO’s but may not buy another pair because the Komodo’s are so versatile and so easy to wear. The new LS (lace system) models are wonderful for those of us with thick feet. I had to carry a shoe horn with me to aid in putting on my KSO’s. The tight fit was a deterrent to removing them for a little barefooting because it could take me 5 minutes or more to get them back on. My Komodo Sport LS’s slip on and off with ease and I love it. I’ll only buy the LS models in the future though it probably doesn’t matter at all for those with daintier feet than mine. “Vibram Stench” is another problem I have that Bill doesn’t have. 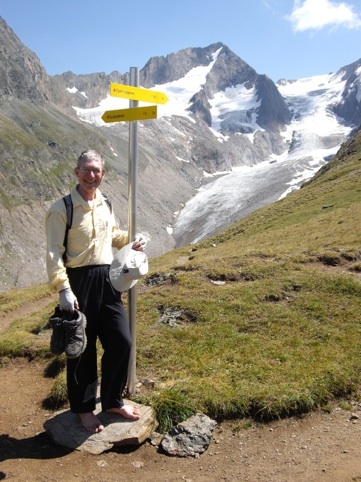 I don’t think of myself as having stinky feet but they are sweaty and they do make 5 Fingers stink--the stench was enough to embarrass myself when sharing an enclosed cable car with other hikers last summer. Talc like that used in baby powder didn’t help enough but “Odor Eaters” foot powder does subdue the notorious stench quite nicely. I give them a fresh shake of powder after each wearing and place them where they will thoroughly dry and I am now presentable in closed spaces. The Odor Eater’s powder does cake on the insole more than the talc. With both powders, I would occasionally brush out the old powder but the Odor Eaters forms a cement like surface that can only be removed with washing. But they don’t have to be washed often and its entirely worth it to again be welcome in small indoor spaces. We’ve each have a pair of the basic Run-Amoc though I like the over-the-instep tying system on their new Dash model better than the around-the-ankle approach of the original model (shown left). Both models are entirely satisfactory however. We’ve bought the 5 mm soles and are very satisfied using them for urban wear, hiking, and trail running. Those wanting more road feel have 2 mm soles as an option. The Soft Star’s are a nice choice for a more presentable urban wear shoe and can do it all. They are also warmer in the cold, wet weather than the 5 Fingers and once mine stretched out a bit, I could stuff my Gore-Tex socks inside them. 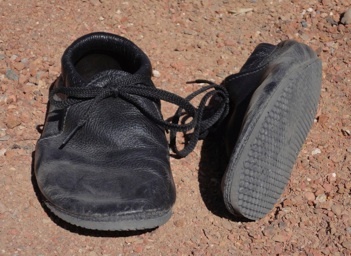 We will continue to have these as a part of our small wardrobe of shoes. This is the first real shoe I’ve attempted to wear in 20 years and they are sufficiently wide and up-turned in the big toe area to accommodate my funny feet. I get sore spots on the Achilles, under 1 lace rivet, and over the top of 1 old bunion. 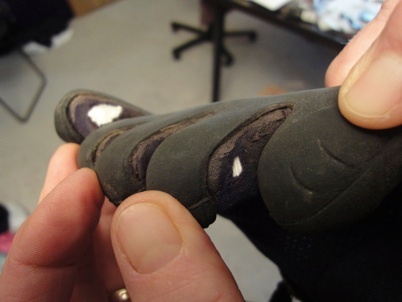 Bill also has lingering discomfort with his model on the top side at the base of the big toe. We are both working to break-in the shoes or our feet to this new arrangement before we run or hike in them. Otherwise, they are an appealing product. The Zilch is a sandal with a bit thicker sole than other minimalist shoes (10 mm). 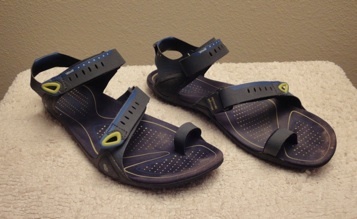 Bill is entirely satisfied using them for walking, hiking, and running, though he hasn’t put a lot of miles on them. Neither of us was willing to take the risk on them at $80 but the deep discount at the end of the season made it enticing for him to give them a try. Women’s models weren’t readily available and so I wasn’t able to even try them on. Too soon to report on their durability but so far, so good and we will likely keep them in our shoe wardrobe in the future. The basic Vibram KSO & an Invisible Shoe huarache. I really want these huaraches to work, but neither of us can master the lacing system to be comfortable. We are doubtful that they will work for us as a hiking shoe but will keep trying. If you are even slightly tempted to dabble with becoming a forefoot striker wearing minimalist shoes or even barefooting, you would likely benefit from some pre-work before you make the plunge. Everyone has different combinations of foot strength, flexibility, and disability and optimizing the health and talents of your feet before making a big gait change will smooth your way. Contrary to the look of most shoes and consequently the look of most feet, toes are designed to fan out a bit rather than pinch towards each other. 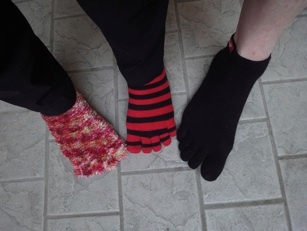 An easy, gentle way to begin nudging the toes apart and increasing the mobility of your feet is by wearing socks with toe pockets. Budget-friendly novelty socks in stripes and multi-colors will be as effective as the staid and more durable Injinji sport socks. Wear them around the house, with or without flip-flops, to decrease the crowding of your toes. A more focused but frustrating way to liberate your toes from their molded-by-shoes shape is to interlace the fingers of one hand with the toes of the opposite foot. Start at the little toe/little finger side and ‘interdigitate’ as many toes and fingers as possible. With time, you’ll be able to slip 4 fingers between 5 toes. Twist, bend, and wiggle when you’ve maximized your interlacing to invite the bones of the foot to separate like the toes have done. Using the toes as levers is one way to create more mobility between the bones of the feet, which opens the door to more flexibility and then strength in the feet and toes. Short toes like mine are no excuse--keep trying. And of course, wearing less confining footwear will support the changes you are making in your feet with the socks or your fingers. Painful bunions at the base of my big toes and Morton’s neuromas in the balls of my feet convinced me to permanently abandon wearing shoes over 20 years ago and that was the beginning of the end of my problems with bunions. Switching to Birkenstocks and other loose-fitting sandals was all it took to significantly calm down my hot spots. 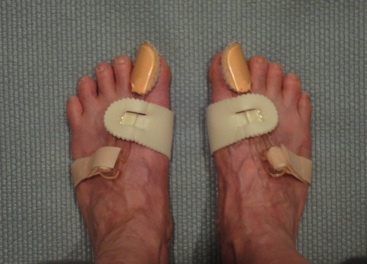 But looking at my feet the other day, I realized that they could be better--that my big toes still tilted inwards a tad and I knew that my ‘bunion bones’ were quick to register a complaint if anything pressed on them. So I bought a pair of plastic bunion reformers at Walmart for $7 to further their progress towards normalcy. The braces (I think of them as orthodontia for my toes) are intended to be worn while sleeping but I didn’t try it. My slumber is so tentative that having contraptions on my feet would ruin my night with the Sandman. Instead, I wear the braces for multiple, short intervals during the day. Sitting to eat, working at the computer, or being a passenger in the car are all bunion therapy times for me. I could immediately see a hint of temporary improvement in my toe position with the first wearing, so I am content to commit to a slow, long term project of nudging my big toes a little farther away from their neighbors to improve the overall health of my feet. Each time that I remove the braces, I spend a couple of minutes doing a little strength work to help re-pattern the tracking of my big toes. Working on one foot at a time, I pull the big toe outwards like the brace had done while I curl the toe as tightly as I can. Occasionally I use my fingers to nudge it to curl more compactly than the toe does on its own and then contract the muscles in this more extreme position. This is a routine I’ve ad libbed but combining flexibility and strength work is usually a winning strategy. Take a look at your own feet to see if they would benefit from such work. If not, determine what else might help restore them to optimal health and function. It’s the ‘dreaded green spiky ball’ that delivers the always painful soft tissue therapy to our feet. We have a love/hate relationship with the ball I bought at REI years ago but it is very effective for improving the deep tissue health of our feet. When we are motivated, like during recovery from a persistent injury, we pull out the green ball to work out the tissue knots in the bottoms of our feet. Fascia is a type of connective tissue that gets bunchy and needs to be smoothed out because of irritations and injuries. One simply puts the ball on the floor, then places the bottom of the foot on top of it and begins rolling the foot over it. Be sure to explore the edge of your arch as well. When you find a tender place on your foot, step down with as much force as you can tolerate for as long as you can tolerate it. Think in terms of minutes, not seconds, then move on to a new spot. Releasing the accumulated knots feels like a hopeless undertaking but it’s not hopeless--it just takes time. It may take weeks to eliminate a painful spot, but view it as a long term project. Releasing the constrictions in the fascia will allow the bones and tissues in your feet to move properly which will make your feet healthier and happier regardless of your gait preference. Feet love being massaged, whether you deliver the TLC or someone else does. Root around a bit between the bones of the foot and don’t hesitate to go deep. Use your thumb to press between the long bones of the top of the foot, especially near the toes. The knuckle of a forefinger can be an effective tool for digging around in the sole of the foot. And the thumb works well for probing the dense heel bottom. Wringing, twisting, and folding are also good strategies for soothing the feet. I’ve labeled Bill as having “origami feet” because I can fold them lengthwise and barely make his big and little toes touch--something my feet will never be able to do. You can use the thumb and forefinger to milk and twist each toe starting from the base and working to the tip. And a pinching motion can be a way to work the outside edge of the foot. Be creative with the goal of making your foot more flexible and more talented. “Toe push-ups” is the name that stuck in our household, but “toe curls” is more accurate. I work each toe individually almost every day after discovering that my toes weren’t very strong or coordinated. I do about 30 rep’s with each toe, applying resistance with 1 finger near the tip of each toe. Make them curl hard and tightly with each rep.
A moderate level of flexibility is a winner for your body whether you’re highly active or accomplished at being sedentary. If you’ve let your hamstrings shorten-up or you’ve reverted to slumping in your chair, revive your old stretching routine or seek a new one to help your body make the most of the upright, relaxed posture that is a part of forefooting forms. You’ll be more comfortable in your body and less injury prone regardless of what you do or don’t do if you maintain your overall flexibility. Calves take a beating when running regardless of how your foot strikes, but they need to be strong for all forefooting activities. An easy way to begin strengthening the calves and feet is by standing with your feet hip width apart and lifting your heels as high as they’ll go, pausing, then gently lowering them down. That’s it, except that you do it over and over again. Maybe you’ll want to start with a dozen repetitions, then wait 2 days to see if the exercise makes you sore. Consider working up to 40 reps every other day. To get the most from this quick, easy, do-anywhere exercise, do reps with both legs, then a single leg. And include rep’s with both straight and bent knee(s) to work both of the 2 major calf muscles. Lift the heels straight up without letting the foot sickle or flare out to the sides. Acclimate your calves and feet to this no-impact exercise before moving on to high-impact rope jumping or beginning a running program. When caring for the calves, it’s important to do both your strength and flexibility work with bent and straight knees. Bending or straightening the knee allows you to isolate the 2 big muscles in the calf, whether you are stretching or strengthening. Many people neglect 1 of these 2 muscles and then don’t understand why they have calf issues. Jumping rope, with or without a rope, is a great way to strengthen the muscles of the feet and calves for the forefoot striking motion as well as being a dynamite cardio workout. Worry not if you never mastered the coordination or you don’t have a rope: bounce up and down on the balls of both feet with your imaginary rope. Actually using a rope is more interesting and challenging, but don’t let the lack of one slow you down. Be prudent and start slowly if this is an unfamiliar activity because lots of muscles need to adapt, as do the knees. Perhaps begin with a half dozen rep’s and call it good for 48 hours to give your body time to inform you of how it is coping with the various stresses. Gradually increase your rep’s, perhaps only jumping every other day. A number of online sites have tips on getting started and drills to make it more interesting. Michael Sandler’s book Barefoot Running includes an assortment of toe and foot exercises if you are ready for more. One of my favorites that is easy and feels effective is creeping a foot along the floor or a carpet like an inch worm. Curl the toes to shorten the foot, then straighten and curl again. You can creep both feet simultaneously forwards and and then backwards with this motion, even when driving on cruise control. Sandler’s book provides wonderful guidance on gradually building strength and endurance to become a barefoot runner but it is a gold mine for anyone transitioning to forefooting, with or without shoes. These bodies really should have come with a user’s manual but they didn’t. Those of us with both problems and a stubborn streak have been forced to write their own manual, and here’s a brief look at mine as it relates to supporting the soft tissue during the transition to minimalist footwear. Listening to the shrieks and groans in our home, I have to assume that we aren’t alone in having little knotty spots in our leg muscles. You may not know that they are there but you do know that your right knee often hurts in that one spot when you’ve upped your activity level or that your calves are prone to getting achey or something feels bunchy in your buttocks and it’s not the chair cushion. If you or a professional goes delving into those places, you are likely discover that they are reservoirs of immediately accessible, intense pain--hence the shrieks and groans. Welcome to the world of myofascial release. I have absolutely no training or credentials in the subject, only my own experience, so be forewarned. But the cool thing about myofascial release is that you don’t have to understand much about what you are doing to do it or to benefit from it. With these simple tools, all you need now is to get on the floor and follow the pain. I love my new foam roller and I eagerly use it daily. The foam roller is a very effective tool for releasing knots in my thighs. I work both the inside and outside thighs from the knee to the groin as well as the front thigh muscles. I don’t find much benefit from the roller on the backs of my thighs or my calves. I do however kneel on it and roll over the tops and sides of my knee caps. To use the foam roller on my thighs, I lie face down on the floor and support my upper body with my arms. 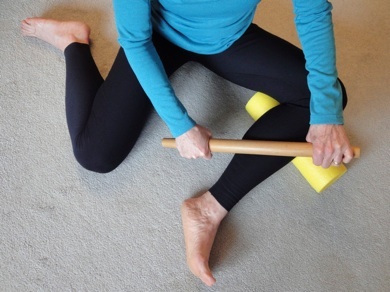 With the roller placed under 1 thigh, I begin rolling my leg over it by scooting my body over the floor, powering with my arms. I roll around in search of a painful lump. Once a knot is identified, I’ll change the tilt of my thigh on the roller to assess if I can intensify the pain by approaching it from another angle. With a hot spot isolated, I press into the roller with my body weight and hold the position as long as I can tolerate it. If I get a really excruciating spot, I’ll roll off of it until I find a tolerable level of pain and then hold this intermediate position. Keep breathing deeply to aid in the release. Some knots will melt away during a single session of a minute or 2; others will require weeks of daily work to resolve. Persistence pays off however. Generating long, broad strokes on the thigh with the roller provides a nice overall massage and is soothing after an intense session. I’ve just starting using my ancient, spindle-shaped rolling pin without handles on my muscles and I love what it does for my hard-to-reach calves. I can dig deeply with it and it’s good for a quick massage to my quads as well. Bill finds the rolling pin to be perfect for sinking into a deep place above his ankle that he can’t work otherwise. Bill likes sitting in a chair and reaching behind his legs with the rolling pin to work his calves. I prefer sitting on the floor, sometimes propping a leg on the foam roller, to most comfortably get into my achey spots. It’s the same strategy here as with the thighs: roll around looking for tender places and then firmly press into them, sometimes tracing little circles while pressing down. Sitting on the tennis ball is the best way I’ve found to get into the knotty spots around the buttock bones. I lie half way onto my side on the floor with the ball between my buttock and the floor to work those areas while bearing some of my body weight with my arms. Think of your Mission Impossible as searching out and destroying all of the little and big knots in your lower body with these 3 tools. I don’t believe in pain when exercising but pain during myofascial release is productive. The power in the method is in playing your own pain edge. At first the knots feel too painful too take on and too intractable to bother with, but they should all release with time. As one hot spot starts to release, you’ll find yourself drawn to another area and you’ll being lingering there too. It’ like peeling an onion: once you pull back the top layers, there are more layers below to be discovered but there is an end point. I like to spend 15 minutes a day working with these simple devices on my legs and buttocks. If you carve out enough time to do a little bit every day, even 5 minutes, you’ll be stunned by the difference in the smoothness of your tissues 2 weeks. During this time, you may notice that some familiar knee pain or calf stiffness has disappeared--it’s not a coincidence. Once you’ve ‘cleaned house’ and eliminated all of the old and perhaps ancient knots, you can shift to maintenance mode in which you use these tools for simultaneously giving your tissues a quick massage and monitoring for new knots. We started working our ITB’s with a basketball instead of a foam roller. This myofascial release technic is an excellent gift to yourself whether you transition to minimalist shoes or not. If you do plan on making the switch, start working on your tissues first and get the previous decades of residue cleaned out of your tissues. With a clean slate and an intimate knowledge of your lower body terrain, you’ll increase the odds of success with your transition. And then as your body begins reacting to the stresses of the new gait, your myofascial maintenance work will reveal the knots right away and you can quickly intervene. Unfortunately it was reading Sandler’s book on Barefoot Running that introduced me to this self-care approach and we were well on our way with forefooting by then. Neither of know which knots were pre-forefooting and which were post-forefooting, though we suspect many were decades old. We didn’t even have a foam roller for 6 months but began by working our ITB’s (iliotibial bands) with a basketball. But no matter how you do it, myofascial release is definitely a ‘better late than never’ activity, so press on regardless and follow the pain to find greater comfort in your body. Transitioning forefooters are no longer on a lonely quest--now there are many others traveling the same path and there are many resources available to access. You can read online and look for the new books on the subject to learn more. Use my information as pre-work, as a launching point, and remember to start slowly: give your tissues plenty of time to adjust to the cascade of changes required to unravel decades of use patterns in your body and build strength and flexibility in new places. Read a few online testimonials from overzealous, highly trained athletes who literally crawled home in pain to convince yourself that you too need to go slowly--view it as a lifestyle change rather than just a sport. The early prudence pays off--then you can go have endless, reckless fun with your stunning, new capabilities as a forefooter.